Barth Hollanddrain is a merger of the companies Barth Holland and Steenbergen Hollanddrain and owned by the Barth Group. These companies are two of the most famous producers of drainage- and trenching equipment. The sustainable heavy duty equipment of Steenbergen combined with the innovative and practical knowledge of Barth guarantees top machines for every type of project. Barth Holland is the founder of drainage by machines in Europe. After the big overflow in 1953 they developed a bucket wheel behind a tractor, which now stands for the first mechanical drainage machine. Over this, they produced and shipped 100‘s of machines all over the world. In the 90’s they sold the export activities to Steenbergen and concentrated on the local market and other products under the name Machinefabriek Barth. 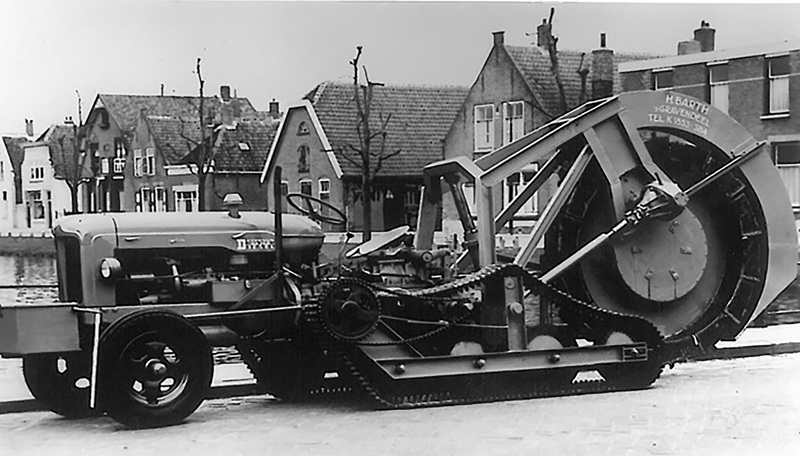 In the meanwhile Steenbergen Hollanddrain took a leading position in producing drainage machines worldwide and developed an impressive and rugged product-range. In 2013 the Barth Group has integrated the activities of Steenbergen in their own production facility and continues under the name Barth Hollanddrain. The Barth Group, owned by the Barth family, consists of a drainage company, called Barth Drainage (www.barthdrainage.nl), and a machine factory, called Machinefabriek Barth (www.machinefabriekbarth.nl). With a modern production facility of 2000 m2 and 30 working people they are able to produce well-designed machines in a big range from subsea, deepwater, agricultural, utility and sportfield trenchers. Own workshop with latest CNC lathes for machining parts, sprockets, gears etc.